The Philly show has a few themed galleries in addition to the showcase gallery. The producers choose the themes – this year they brought back the Steampunk gallery – always a favorite with both the artists and the collectors. 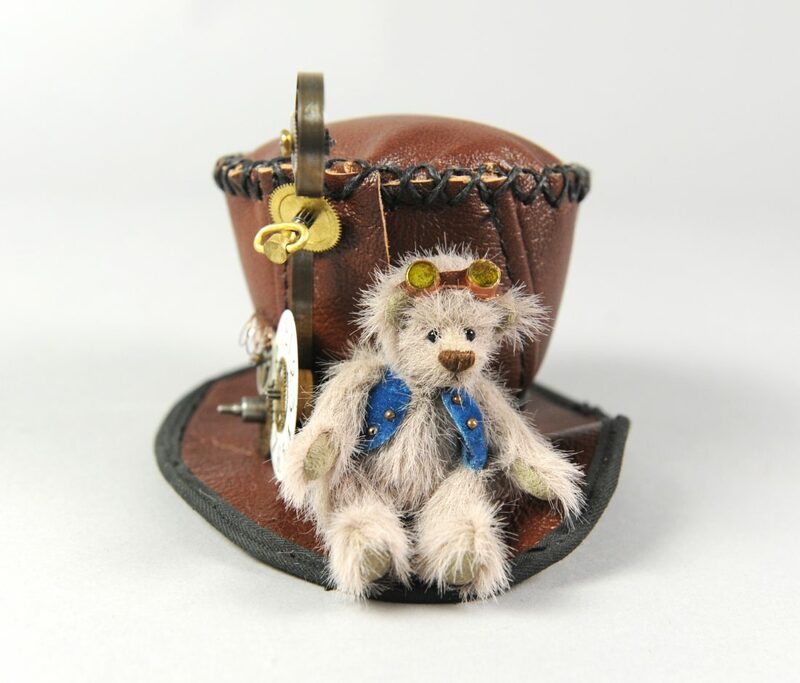 I was first thinking along the lines of a larger bear wearing a steampunk top hat, but since I’ve decided to try to focus mostly on the miniatures this year, I made the bear part of the hat. 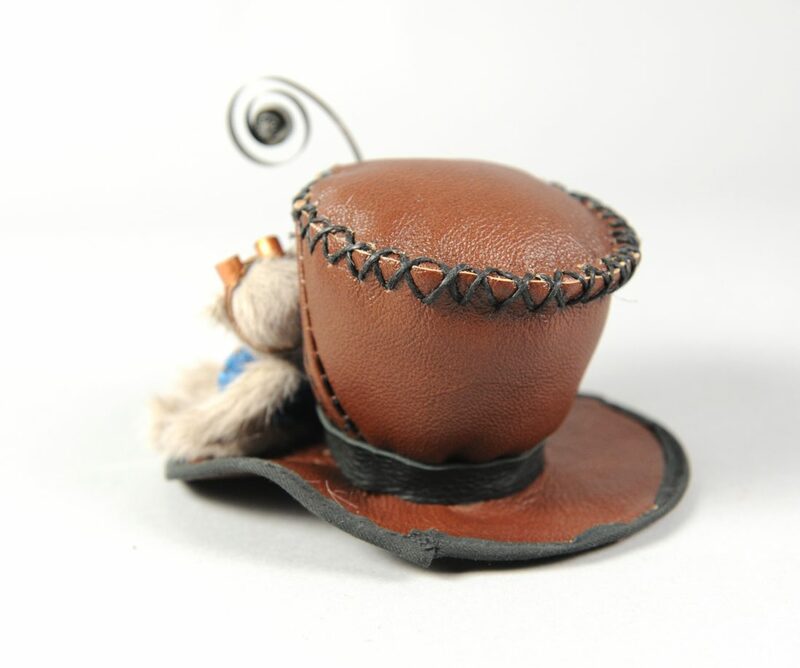 The hat is made from a leather upholstery sample piece and the pattern pieces were cut using the Charity Wings top hat Sizzix die. Once the pieces were glued together, I added decorative stitching with waxed cord in several areas. Another scrap of leather was added for a hat band and then I began to play with gears and parts scavenged from vintage alarm clocks. The old wind up Big Ben clocks have lots of nice brass gears in them and are not too difficult to take apart. The alarm clock faces would have all been too large, so I dug through my box of old watches until I found one with a nice large face. The Sizzix die is designed so the hat can be worn using a headband. It fits into slots on the bottom of the hat, allowing it to be removed when desired. 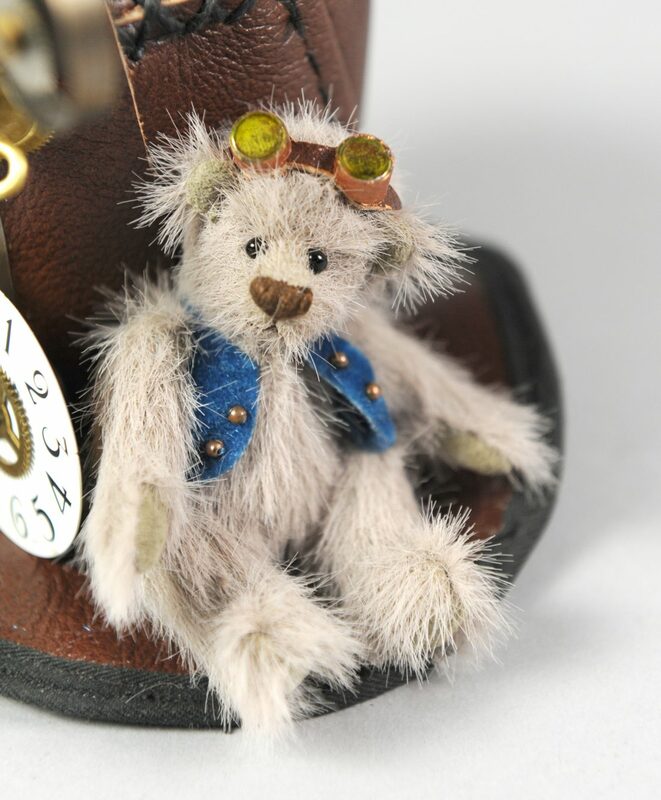 The bear, whose name is Barnaby, is made from a long pile miniature plush fabric. He is internally jointed, with glass eyes and thin ultrasuede pads. 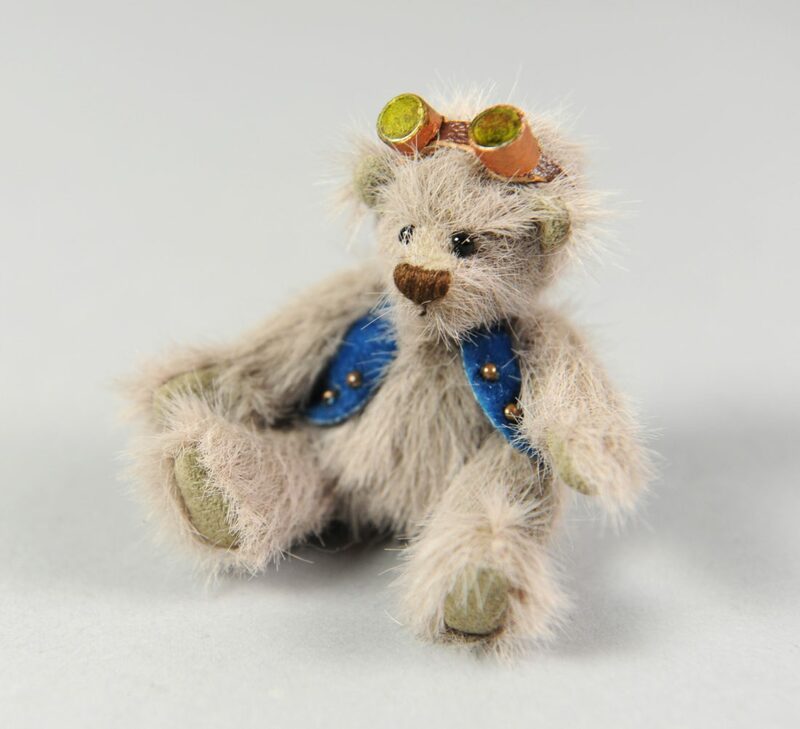 Barnaby wears a vest made from vintage blue upholstery velvet with tiny brass bead buttons and his goggles are made from scrap leather, mica and a broken plastic straw. A bit of copper paint and some green alcohol ink were the final touches needed. Barnaby’s vest has a snap on the back which allows him to attach securely to the hat’s band. I hope you enjoyed meeting Barnaby as much as I enjoyed making him and the hat. 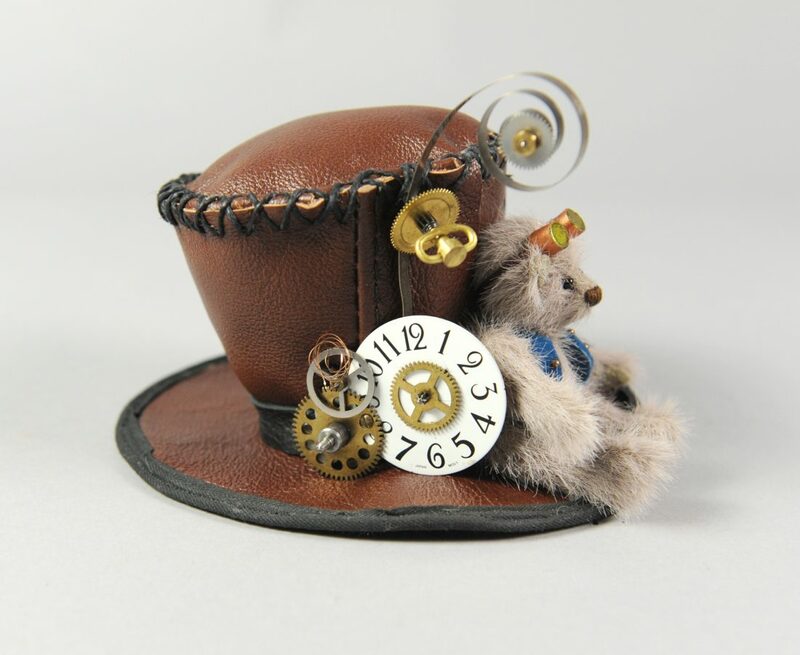 This entry was posted in teddy bears and such and tagged artist bear, miniature bear, steampunk. Bookmark the permalink. Super cute!!!!! must have been a lot of work going into this!!! !